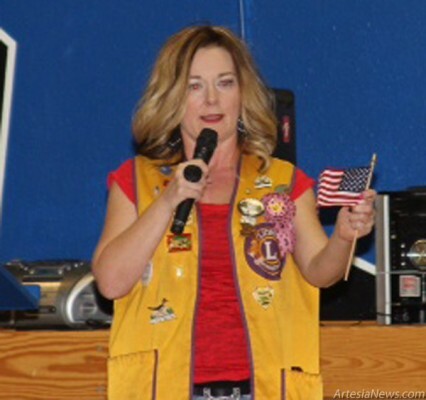 Hermosa Elementary School welcomed the Lions Club March 1 for a Flag Day Program coordinated by Lynn Sundheimer and Missy Williams of the Lions Club. Hermosa Principal Paula Menefee opened the program with the posting of the colors and Pledge of Allegiance. Songs throughout the program were “The Star-Spangled Banner,” “You’re a Grand Old Flag,” “America the Beautiful,” “This Land is Your Land” and “Thankful for the USA.” Hermosa students were given a demonstration on the folding of the flag and information on its colors and meaning. 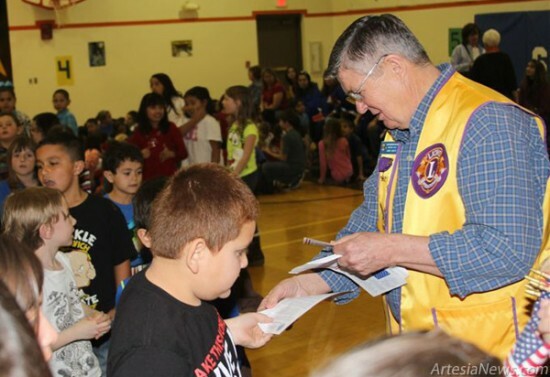 Above, Lions Club member Gary Scott distributes information sheets to students. Top picture, Williams addresses the crowd.